Heard about the floating state? 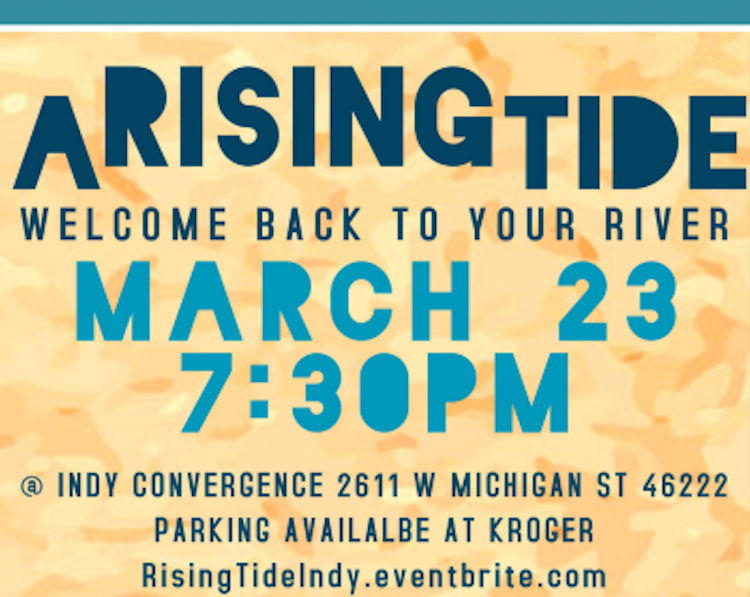 Help Indy Convergence kick-off our new project “A Rising Tide” with a panel discussion about the White River, music, and our 2019 performance dates. Come learn about the initiative around the new floating stage on the White River. We’ll have two short panel discussions so you can hear from city leaders about the neighborhood, city, and county-wide plans to make our river a destination for arts, culture, sports, and recreation. This event will be your first chance to get tickets to all “A Rising Tide” events for 2019. You can also sign up for a free, guided nature hike of performance locations on Sunday March 24. Enjoy sweet, soulful sounds from musical guests Ramon Hutchins and Damon Karl between the panels with tasty wine and beer while you learn more about your river. Welcome back to your river, we’re glad you’re here. Huge thanks to Reconnecting to Our Waterways whose initial grant is making this ALL possible. Tickets are available on our eventbrite page. Parking is available at Kroger across the street from Indy Convergence.